What Would Republicans Do Instead of the Affordable Care Act? A new spate of proposals from Republican presidential candidates to repeal and/or replace the Affordable Care Act (ACA) raises the important question: Given an unobstructed opportunity, what would Republicans really do with the Affordable Care Act? Would they repeal the law wholly or just in part? With what might they replace it? Some suggest that Republican Congressional leaders only advance full repeal to placate their Party’s conservative base, knowing well that repeal cannot survive a certain veto while Barack Obama is President. In January 2017, that obstacle will vanish if Republicans control the White House and both branches of the U.S. Congress. What then? Unfortunately, the proposals now being advanced by the Presidential candidates are far less than comprehensive, and leave many more issues unanswered than answered. Of the eight proposals, four were advanced by Republican Members of Congress. The most prominent of these is the Patient CARE Act offered by Sens. Richard Burr (R-NC) and Orrin Hatch (R-UT) and Rep. Fred Upton (R-MI); the latter two are the current chairmen of the Senate Finance Committee and the House Committee on Energy and Commerce respectively, both committees with primary ACA jurisdiction. Though narrative versions of Burr-Hatch-Upton were released in 2014 and 2015, the authors have not translated their proposal into legislative language that can be evaluated by the Congressional Budget Office (CBO). While the other Congressional proposals have been introduced as legislation, none have received CBO scores. Five plans propose complete ACA repeal without exception. The Patient CARE Act would repeal the entire law “except for the changes to Medicare” without elaboration. Sen. Cruz’s legislation would repeal only Title I. Only the Roy proposal would modify policy within the existing ACA statute. Beyond these eight plans, the fiscal year 2016 budget resolution, approved in May by exclusively partisan majorities in the U.S. House and Senate, includes explicit instructions for full ACA repeal. What policies might they seek to implement instead? All of the Republican plans but one include some form of financial support to help consumers pay premiums, though no consensus exists on the form of that support. Five propose limited tax credits while two endorse more limited tax deductions. All are substantially less generous than the ACA’s premium tax credits. All plans but one would eliminate the ACA’s financial subsidies that limit excessive consumer cost sharing. All but two propose expansion of high-deductible Health Savings Accounts (HSA). Regarding guaranteed issue, medical underwriting, and pre-existing condition exclusions in health insurance policy rating, while all plans endorse the principle of guaranteed issue, all but one require that individuals have at least 12-18 months of continuous coverage to avoid medical underwriting. Though two plans preserve the ACA’s ban on lifetime benefit limits in insurance, six do not, and all but one (Roy) eliminate the ACA’s ban on annual benefit limits. Six plans would permit the sale of health insurance across state lines and promote re-establishing state high-risk pools for individuals with pre-existing conditions. 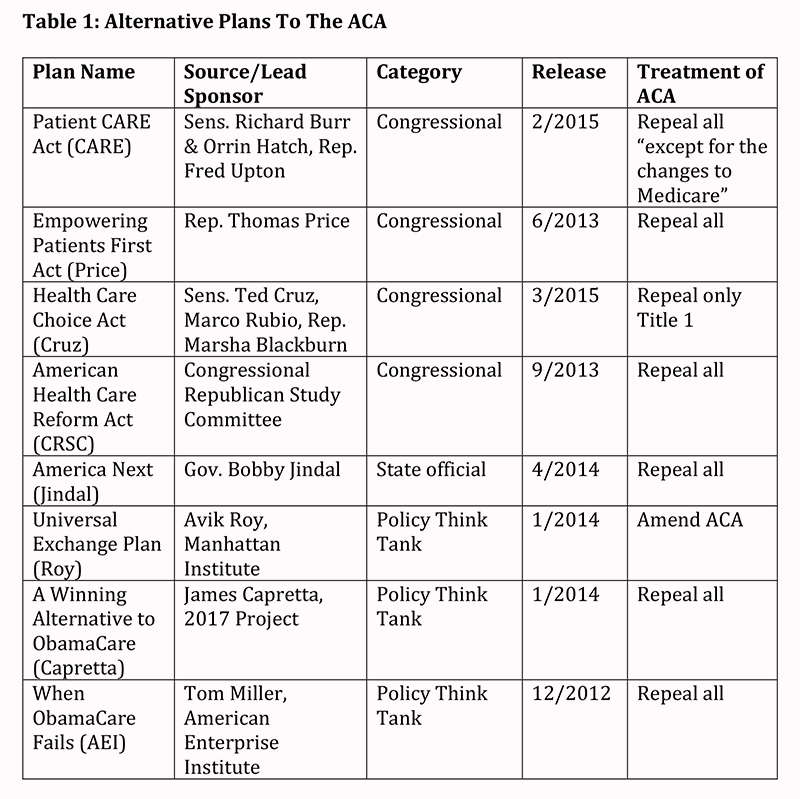 All plans but one address medical malpractice reform, though without consensus on how: four propose mandatory federal caps on non-economic damages, and three propose tribunals or other new mechanisms. In summary, the plans demonstrate a clear intent to deregulate most consumer protections established in the ACA, and to eliminate the individual and employer mandates. More limited tax-based assistance would be available to fewer consumers and that assistance would not vary by income. Guaranteed issue and the elimination of pre-existing condition exclusions would apply only to individuals who can maintain continuous coverage. Some form of malpractice reform would likely be included. Seven plans would eliminate the ACA’s Medicaid expansion to families with incomes under 138 percent of the federal poverty line. Regarding a replacement, no consensus appears. Two plans endorse converting Medicaid into block grants for states; others allow low-income families to use limited and non-income based tax credits or deductions; one establishes HSA-like Medicaid Opportunity Accounts. Plans also propose sweeping changes for all or most pre-ACA Medicaid eligibility categories. Only two plans would preserve existing arrangements for aged, blind, and disabled enrollees; all others are silent on this point. 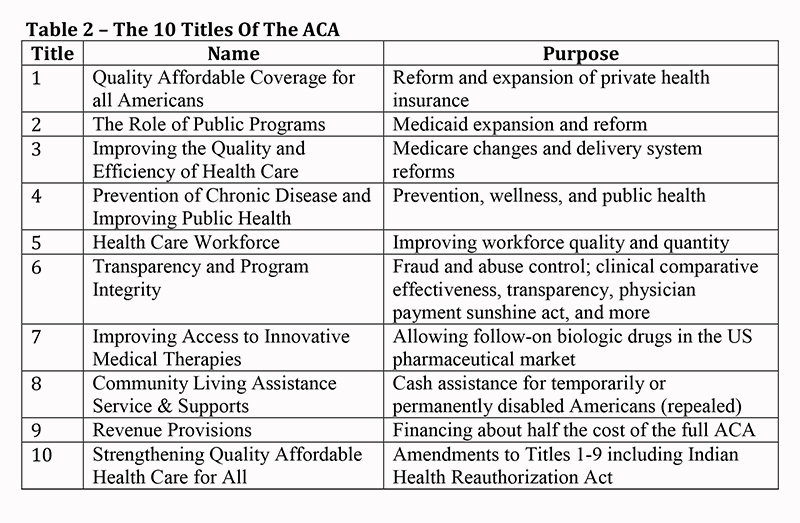 This central ACA title contains two sets of policies: first, improved benefits for Medicare enrollees coupled with spending reductions to providers (except physicians) to help finance Titles 1 and 2 coverage expansions; and second, initiatives to improve the quality, efficiency, and effectiveness of medical care. and Medicare Advantage quality incentives. No consensus is evident regarding the future of Medicare beyond repealing the ACA provisions. plus provision for new taxes to finance a substantial part of the ACA. Financing, of course, is a crucial consideration in any Congressional action. A June analysis by the CBO determined that full ACA repeal would increase the federal deficit over the 2016-25 decade by $137 billion to $353 billion. Importantly, the Burr-Hatch-Upton Patient CARE Act would retain Title 3’s Medicare payment reductions, thus providing an estimated $879 billion in retained revenue that could be used to repeal the rest of the ACA in a deficit-reducing fashion. If indeed there is a path to repealing the ACA that also reduces the federal debt, this one, Burr-Hatch-Upton, is the only one of the eight plans that offers a clear path to accomplish it. and more. Public discussion concerning ACA repeal proceeds without consideration of the real and significant policy impacts and consequences. Public conversation needs to better educate Americans about the many significant policy impacts that would be wrought by repeal of the ACA. The authors thank Kelsey Brykman and Ellen Fugate for their research support.